Licensed Practical Nurses (LPNs) play a critical role in delivering effective health care services. Their positive attitudes and compassionate care play an influential role in patient recovery. LPNs spend a great deal of time with patients, so they’re often the main source of information relating to the patients’ progress. They work under the supervision of an RN or physician monitoring patients’ health, maintaining health records, administering basic nursing care, providing for patients’ comfort, and discussing concerns with registered nurses and doctors. Experienced LPNs may also administer medication and direct other LPNs and unlicensed medical staff. To become an LPN in Oklahoma, you must complete and accredited program, which takes approximately one year, and sit the National Council Licensure Examination or NCLEX-PN. After the Oklahoma Board of Nursing approves your application for a state license, you can begin working in health care facilities, general medical and surgical hospitals, nursing care facilities, physicians’ offices, and community care facilities for the elderly. Oklahoma’s 40+ Board-approved nursing education programs are designed for adults 18 years and older. The post-secondary program equips students with the academic and clinical skills that will help them serve as valuable members of a healthcare team. In the classroom, students learn the concepts of nursing, mental health concepts, fundamentals of nursing, pharmacology and intravenous therapy skills, anatomy and physiology, pediatric nursing, maternal-newborn nursing, medical surgical nursing, and transition to practice. Students apply the concepts learned in the classroom in a supervised clinical setting, such as a long-term care facility or hospital. Applicants must possess a high school diploma or GED, have basic computer literacy, pass drug screening and a criminal background check, and provide verification of immunization through vaccination records or declination statements. The applicant must also have liability insurance, current American Heart Association CPR, and complete the prerequisite courses. Prerequisite programs include medical terminology, anatomy and physiology, and chemistry. It is vital that you enroll in a program approved by the Oklahoma Board of Nursing to facilitate the smooth transition into state licensure. The NCLEX pass rate is another vital factor, as it will reveal your chances of passing the exam based on the school’s history. Graduates of Board-approved programs are eligible to take the NCLEX-PN for state licensure and excellent employment opportunities as LPNs. Duration and Cost of Training: It is possible to complete a nursing program in 11 months on a full-time schedule. Adults with family obligations or full-time careers may elect to enroll in the program part-time, which could result in a completion time of 18 to 24 months. It is important to seek advisement before registering for the program as you may have to take the classes in sequential order and attend clinical sessions based on a set schedule. The average cost of a 1500 hour program in Oklahoma is $6,400 plus expenses for textbooks, uniform, fees, transport to the clinical sessions, prerequisite courses, immunization, TB testing, and criminal background check. To be eligible to take the computer adaptive NCLEX, you must submit a completed application, fee, and transcript to the Oklahoma Board of Nursing, and registration form and $200 fee to Pearson Vue. Both applications must be submitted within two years of graduating from the nursing education program. If you submit your application for licensure by exam more than two years after completing the nursing education, you must complete a Board-approved refresher course or complete didactic coursework and a supervised clinical experience (at least 160 hours). You can register for the exam online, over the phone, or by postal mail. Submit your registration request two months before graduation to allow time for processing your application. Registration over the web or phone requires payment by credit card. You can submit your payment using a money order or certified check if you register by mail. Only graduates of an approved nursing education program are eligible to take the exam. After a successful review of your application and transcript, the Board will approve your request and authorize Pearson Vue to send the Authorization to Test (ATT) letter, via email, providing instructions for scheduling the test within a 90-day timeframe. The Candidate Bulletin provides critical information on registering, scheduling, and taking the exam that will help you to avoid costly mistakes before and during the exam. 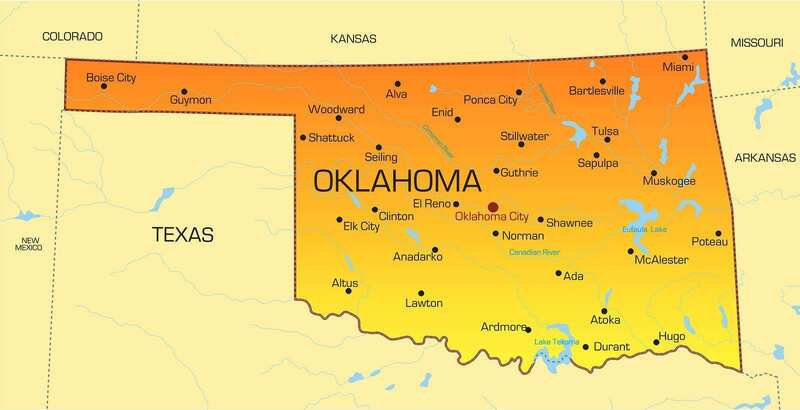 There are three testing centers in Oklahoma – Oklahoma City, Tulsa, and Norman. However, you can take the NCLEX at any testing center across the country for licensure on Oklahoma. The centers are open six days a week and up to 15 hours a day for convenient testing. If you fail the exam, you can retake it after 45 days. However, you must submit a new registration and fee. The exam results will be available within 24 to 96 hours. The Board will not give results over the phone. If you pass the exam, the Board will issue your license if you meet all other requirements for licensure. It is unlawful for any person to assume the role or use the title Licensed Practical Nurse or the abbreviation LPN unless permitted by the Oklahoma Board of Nursing. To assume the role or title would be to commit a misdemeanor, which is punishable by imprisonment or a fine. All applicants for licensure must be at least 18 years of age and a U.S. citizen, national, legal permanent resident, or qualified alien. Applicants must also provide evidence of high school completion and graduation from a Board-approved practical nursing program. The nursing education program must include theory and clinical experience in the care of adult and children, maternal-newborn nursing, and psychiatric-mental health nursing. Effective January 2013, all applicants for licensure must complete a fingerprint-based background check no more than 90 days at the time of submitting the application. The background check involves a search of the Oklahoma State Bureau of Investigation and Federal Bureau of Investigation databases. In addition to the criminal history check, an applicant charged with a felony or misdemeanor or subject to disciplinary actions must submit a report in writing to include a full set of certified court records or board order. Applicants with one or more felony convictions cannot apply for a license for at least five years after completing the terms of sentencing unless the applicant receives a presidential or gubernatorial pardon. It is recommended that you submit your application for licensure two months before graduating from the nursing education program to allow adequate time for processing your application. Submit your application online for faster processing. A paper application is available by written request to the Board. Include an 8.5 x 11-inch postage-paid return envelope with your request for the paper application. In addition to your application for licensure, you must complete NCLEX registration available on the NCLEX website. Complete and submit the application for licensure online and use your full legal name and provide your social security number. Include your email address for faster communication with the Board. Complete the evidence of status form and submit a copy of an “acceptable document” to prove your citizenship or legal permanent residence in the U.S. Qualified aliens must submit the Evidence of Status form in person to the Board along with the original documents that support the qualified alien status. Provide fingerprint images for the criminal history records search through the OSBI and FBI. The Board-approved vendor for the search is L-1 (MorphoTrust), and the search must not be older than 90 days prior to submitting the application for licensure. Oklahoma residents should submit their fingerprints electronically at a vendor location. Out-of-state applicants should request fingerprint cards from the Board. The law enforcement agency taking the prints should mail the completed card directly to L-1. Submit a report in writing, including certified court documents if you answer “yes” to the criminal charge, discipline, or competency questions on the application form. Pay the registration fee of $85 using your Visa, MasterCard or electronic fund transfer if you use the online application. For paper applications, you should attach a certified check, cashier’s check or money order for the registration. Board-approved nursing education programs send transcripts to the Board automatically after the student graduates. Check with your program’s administrator to verify that your transcript has been forwarded to the Board; the transcript should indicate the date of graduation and the degree earned. Graduates from out-of-state programs must request that the school sends the official transcript directly to the Oklahoma Board of Nursing. Register with Pearson Vue to receive the Authorization to Test letter once the Board approves your eligibility to test – use the same name on your application for licensure. The application, once received by the Board, remains open for a period of one year. After that time, you must submit a new application, including documents and the registration fee. Practical nurses licensed in another state or U.S. territory may endorse their licenses in Oklahoma. The applicant for endorsement must demonstrate proof of nursing education from a recognized program. Complete and submit the application for endorsement online, making sure to use your full legal name and your social security number. An email address will pave the way for faster communication with the Board. Complete the Evidence of Status form and submit proof of your citizenship or legal permanent residence in the U.S. Qualified aliens must submit the Evidence of Status form in person to the Board along with the original documents that support the qualified alien status. Provide fingerprint images for the criminal history records search through the OSBI and FBI. The fingerprint must be submitted no more than 90 days before submitting your application for endorsement. If you’re residing out of state at the time of the application, you should request fingerprint cards from the Board, submit your fingerprints through a local law enforcement agency, and have the agency mail the completed card directly to the L-1. Submit a report in writing, including certified court documents or a board order if you answer “yes” to the criminal charge, discipline, or competency questions on the application form. The endorsement fee is $85, payable using a Visa, MasterCard, or electronic fund transfer as part of the online registration process. For paper submissions, you should pay using a money order, certified check, or cashier’s check. Request the temporary license during the online process for a temporary 90-day permit. Include the fee for the temporary permit and proof of current unrestricted licensure in another state. The Board will not issue a temporary license to an individual with a history of arrest, criminal charges, adjudication of incompetence, or disciplinary action. Provide a copy of a legal document indicating a name change if your current license is not in your present name. Verify your license. The licensing agency must verify your license through Nursys or in written form through direct communication with the Oklahoma Board of Nursing. Verify your continuing qualifications for practice. Ask your employer to complete an Employment Verification Form if you worked a minimum of 520 hours as an LPN in the last two years. If you did not complete at least 520 hours of practice, you must submit an official transcript or certificate of completing a refresher course approved by the Oklahoma Board of Nursing or another list of recognized refresher courses. You must re-take the NCLEX to establish continuing qualification for practice if you did not work the minimum hours, completed a board-approved refresher course, or completed hours in a nursing education program. The application for licensure by endorsement is valid for one year from the date of receipt. If you do not submit the documents to complete your application, you must submit another application and fee. No applicant should begin working without the Board’s confirmation of a temporary permit. The issuance of a temporary permit is no guarantee of approval for a permanent license. LPN licenses expire on the last day for the licensee’s birth month in odd-numbered years. For fast and efficient renewal, use the online portal and pay the $75 renewal fee using your Visa, MasterCard, or electronic transfer. Print the confirmation receipt for your records. It will serve as verification of your renewal submission. Verify the status of your license approximately 2 business days after your submission. The Board will mail your pocket license card within 3 weeks. You are not eligible to renew your license online if your license is inactive, suspended, revoked or lapsed. Submit an application for reinstatement if your license is inactive or suspended. You cannot renew online if you have not submitted proof of your continuing education for a Board audit. Three broad industries are projected to account for Oklahoma’s job growth in the next decade: they are educational and health services, professional and business services, and trade, transportation, and utilities. While the three industries will account for two-thirds of the state’s job growth until 2018, the health services industry will produce the lion’s share of job growth with twice as many jobs as educational services. Ambulatory health care and nursing will add more than 7000 new jobs in the next decade, resulting from the gradual aging of the population and advances in new technologies that add to life expectancy. The shortage of qualified LPNs is an immediate and long-term need as the demand for health care services continues to grow rapidly. With an estimated 14,710 LPNs employed in Oklahoma, state agencies estimate a 14% growth in response to employer demands for more staff. The median hourly wage for Oklahoma LPNs is $17.73 or $36,870. LPNs in the metropolitan cities earn more than those in the rural areas. Yay I got to get on the ball. Some of us CNAs make LPN pay but need credentials to perform LPN duties. LPN will be the next step for me!!!! It’s honorable to climb the ladder of success in your own timing! Make more money as a REGISTERED NURSE. Yes you can make more money as rn but with the cut backs lpn would be the way to go for now. Just plan on going to rn later. Great information! It really breaks it down what all it takes! Danielle Nicole you should check this out! I’ll pass. They barely make more than I do. More responsibility for a dollar or two more an hour. I’ll stick to giving showers. I will keep my cna and chha and not deal with the headache for practically no raise.